Pennington Waves is about 300m from the main beach, there are life guards in December and during Easter holidays. What kind of services are offered? Pennington Waves are self-catering and the kitchens are fully equipped. There is a restaurant, coffee shop and supermarket in the complex. What does the kitchen offer? Each kitchen is fully equipped with utensils, kettle, toaster, microwave oven and stove. All linen is provided. If guests require extra pillows, they will need to provide their own. We do provide bath towels. Beach towels not provided, guest must bring their own. 2 Bedroom: The lounge has air-conditioning. The bedrooms have ceiling fans. 3 Bedroom: The main bedroom and lounge have air-conditioning. The other bedrooms have ceiling fans. Bath and/or shower facilties available. The units are fully self-catering, toilet paper will be supplied the first night of arrival. What does the lounge offer? Are the units wheel chair friendly? The building is unfortunately not easily accessible for wheel chairs. The parking area is access controlled and the parking bays are shade netted. There is a laundry on the ground floor in the shopping centre – to be used and paid at own costs. How far is the Restaurant / Bar? There is a restaurant in the complex, also a beach kiosk within easy walking distance as well as several other options at the nearby golf ranges. There is a bar as part of the restaurant. The Pennington Mall is on the ground floor beneath the accommodation units. Shops include a restaurant, pharmacy, laundry, lawyers office, estate agents, post office, house decor with coffee shop, second-hand book shop, bottle store and a supermarket. 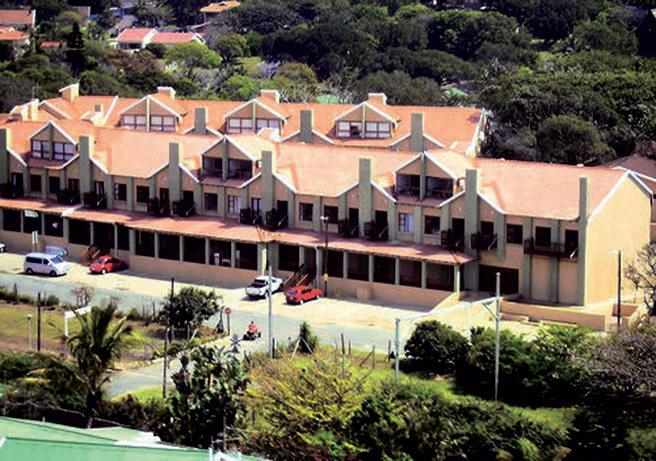 Umdoni Country Club and Selbourne Country Club is less than 5 km from the Pennington. Scottburgh is about 20km from Pennington. There is a spacious communal garden with swimming pool and braai area in a secluded courtyard. There is a medical doctor situated in Pennington, less than 500m from Pennington Waves accommodation. Can you drink the tap water? Do we need malaria precautions? No, it is not a malaria area. There is an ATM in the complex. Pennington does not have a fuel station, the nearest fuel stations are at Park Rynie, about 10km from Pennington. King Shaka international airport is 90km from Pennington. Unfortunately we do not provide Airport Transfers or any local transport. away from the golden sands of Pennington beach. Offering 2 or 3 bedroom units fully equipped for a relaxing stay. Enjoy a braai while relaxing next to our private swimming pool in a secluded courtyard garden with ample play area for the kids.